You can learn about the campaign at JusticeforLB website and you can read the inquest happenings over on twitter @LBinquest. At some stage I’ll write about the inquest process, the amazingly resilient and love filled family and friends of Connor; the forensic attention to detail, care and expertise of the legal team; the smatters of candour juxtaposed with complete refusal to change anything even with hindsight that we heard from witnesses [only the psychiatrist was that arrogant]; and the whole process. For now I just wanted to pick up on one small [but really massive] language point. Connor’s death was not tragic. 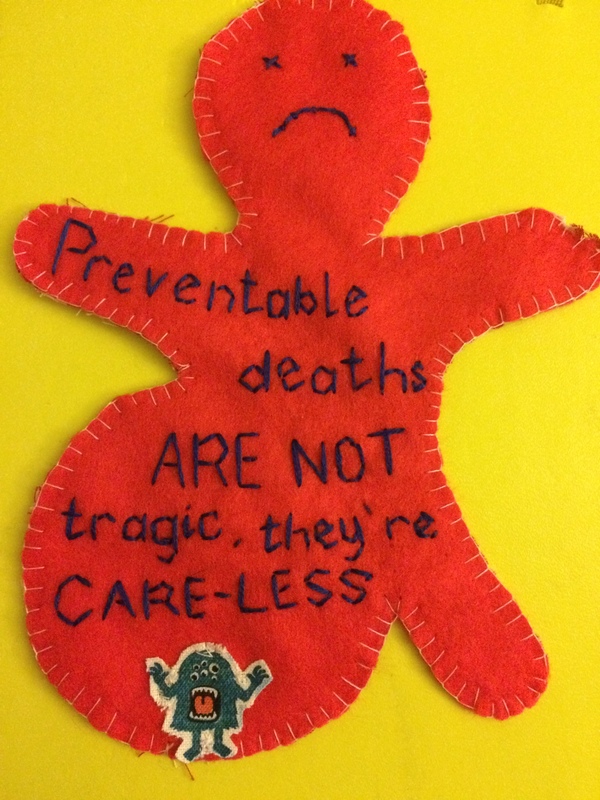 Preventable deaths are not tragic. Connor’s preventable death was described in great detail over the two weeks, the time immediately before it and on the day of it, with some minor attention paid to what happened after it (up to the Care Quality Commission unannounced inspection two months after LB’s death where they looked at 10 different aspects of care and the unit failed every one – subsequently being closed down). Southern Health NHS Foundation Trust, it’s CEO Katrina Percy, and their Medical Director Lesley Stevens all keep trotting out the same apology. None of them reference that Connor’s death was due to neglect, none of them reference the appalling way that they have treated Connor’s family during his care and in the more than two years since. All of the Southern Health apologies rely on the use of the word tragic or tragedy and given journalists wish to produce a balanced piece, they are nearly always ending with a statement from Southern Health. Connor Sparrowhawk died by drowning following an epileptic seizure while in the bath, contributed to by neglect. So please can we stop talking about the tragedy of Connor’s death. It was not tragic, it was utterly preventable and avoidable and careless. Until people start taking actual responsibility for their failings, and yes I’m looking at the senior managers of Southern Health NHSFT, nothing will change or improve. Let’s not forget the Trust tried to pass LB’s death off as natural causes on more than one occasion and that’s not mentioned in their apology either. They could do with learning some lessons from the student nurses in their service, told off for being too hands on, and the nurse who stood up with such courage and compassion and candour and apologised for her failings. That was a meaningful apology and the management team could learn a lot from her. So completely right and true. These higher ups need to be a darn sight more specific about what they are ‘apologising’ for. Of course they won’t, because then they might be looking at corporate manslaughter on top of being a bunch of cold-hearted calculating care-less human beings. Thanks for hitting the nail on the head again George. The “tragedy” narrative is pervasive with learning disability; it’s “tragic” that these “defective” people exist, parents are “saints” for putting up with them. And the only acceptable reaction to any support we are given is gratitude. How dare we suggest that they deserve better? That would just be being demanding and toxic parents. Our intense love and our ambitions for good lives for our gorgeous, quirky dudes is obsessive and deluded. So grateful to you George, and Sara for your bravery in exposing this. So sad that it’s necessary.